What’s exciting is that this could be one of the oldest moon shawls known. It’s certainly endowed with all the attributes of what we know about the early ones: tiny central and quarter medallions and an overall diminutive size. 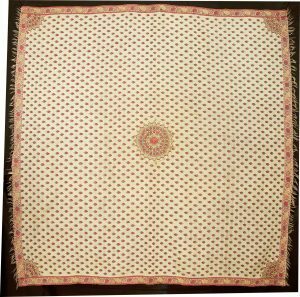 However, what makes it stand out from all others is its large patka-like border containing botanical elements found only on 17th shawls. Besides the calligraphy, the most unusual botanical element is the cluster of the three yellow flowers that alternate between the cartouches. 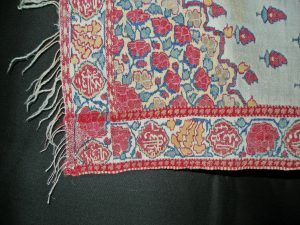 In forty years of studying world collections I’ve seen this particular floral style- and rarely at that- only on shawls and textiles of unquestionable 17th century provenance. 117a-Buti Fragment, late 18th c.